I’m beginning my new serial with ‘Twas the Night Before New Year, inspired by the children’s poem by Clement C. Moore and a personal experience. As you may know, the legend is that Clement Clarke Moore wrote A Visit from St. Nicholas on Christmas Eve, 1822 on a sleigh ride home from Greenwich Village. His inspiration may have been Sinter Klass or more literary sources. In any case, The Night Before Christmas became a self-published classic, loved and treasured from generation to generation. Moore refused to acknowledge this work until fifteen years after its appearance in a neighboring town’s newspaper and became an overnight success – in today’s terminology – went viral. Very little of his scholarly work is remembered, but he reluctantly included this ‘mere trifle’ in a collection of other writings in 1838 and became a legend as well as generating an industry based on the trifling matter of Santa’s sleigh ride through the midnight sky. I have written ‘Twas the Night Before New Year for fun. 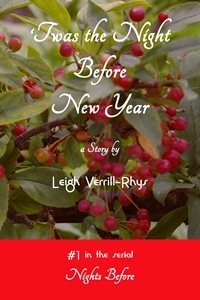 This humorous serial novel will follow the trials and tribulations of Portland, Maine small press editor, Jocelyn Tavers, after she is abandoned by her fiancé – who’d rather be skiing, without her – on New Year’s Eve, through a year of Nights Before. Thank you, gpicone and weaklyshortstories for reading this post.